We partner with many organizations, charities and events across Tennessee which help the people in the community that we love to serve! Gossett Motor Cars organizes, donates to and participates in many different events and organizations in the Memphis area. Best Buddies Tennessee - The goal of Best Buddies is to establish a global volunteer movement that creates opportunities for one-to-one friendships, integrated employment, and leadership development for people with intellectual and developmental disabilities. Gossett Audi Memphis has been a proud presenting sponsor for Best Buddies local events for years. Hyundai Hope on Wheels Their mission is to end childhood cancer by funding innovative research and creating public awareness by stimulating social conversations and serving as a thought leader. 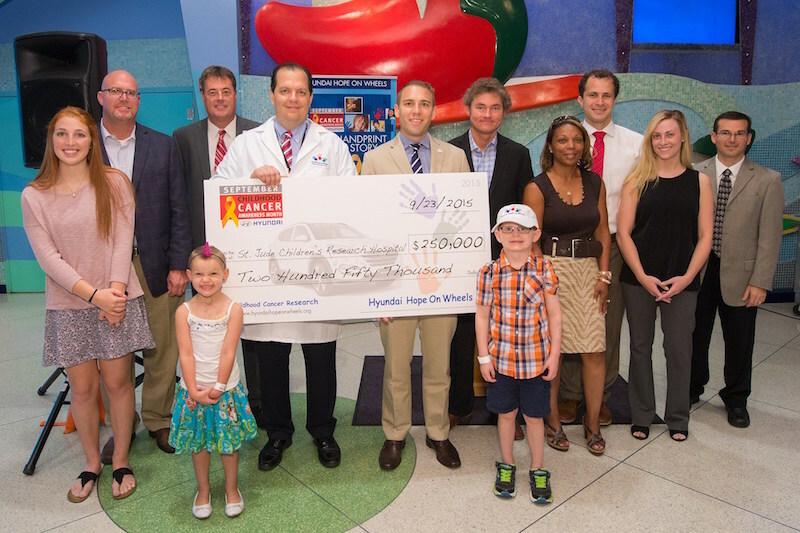 Gossett Hyundai supports each year at the check presentation ceremony held at St. Jude Children’s Research Hospital. Laughs for LeBonheur - This star-studded comedy show was created by Gossett Motor Cars’ very own Nate Hall to benefit Le Bonheur Children's Hospital. The mission of Laughsprin is to use the healing power of laughter to help the people at Le Bonheur assist the needs of sick children from all over the world. Youth Village’s “Dodge This”- Dodgeball Tournament - Youth Villages is a private nonprofit organization dedicated to helping emotionally and behaviorally troubled children and their families live successfully. For six years, Gossett Motor Cars has sponsored and participated in their annual dodgeball tournament to raise money and awareness for this wonderful organization. Memphis in May - Memphis in May International Festival is a not for profit, community-based organization, whose programs contribute more than $70 million in economic impact to the community, foster civic pride, promote awareness of Memphis heritage, and build international relationships through education. Gossett Porsche sponsored their inaugural Great American River Run in 2016. Cardiac Classic Golf Tournament - The money raised from this event benefits the BMHC Foudation’s heart fund. As a faith-based, not-for-profit organization, "Get Better with Baptist" is not just a slogan; it's a way of life that Baptist Memorial Health Care Foundation and Gossett Motor Cars are proud to support. Additional Community Involvement - The Gossett family is strong supporters of the University of Memphis and their athletic programs, and Al Gossett is also a member of the NBA Memphis Grizzlies ownership group and can be frequently spotted at the games cheering on his favorite team. If they can do it, so can you! Take a look at the stories below - we can help you reach your goals! We prefer to promote from within and if you are a hard worker with a desire to improve on a daily basis, you can build a great career at Gossett! Take Jordan Echols, a Sales Manager, for example. He started at Gossett in October 2013 as a salesman with no experience in the industry up to that point. He never thought of himself as a car salesman but after a learning from another salesman for a few days, he landed a HUGE deal. That huge deal led him to move into a Porsche sales role by March of 2014 and after a successful stint there, he was offered an F&I role almost 2 years to the date he began with Gossett. Recently, he has moved back into the sales world but this time he's a Sales Manager. In addition to Jordan, pictured to the left is JT Johnson - our esteemed Gossett Kia Covington Pike Elite Sales professional! 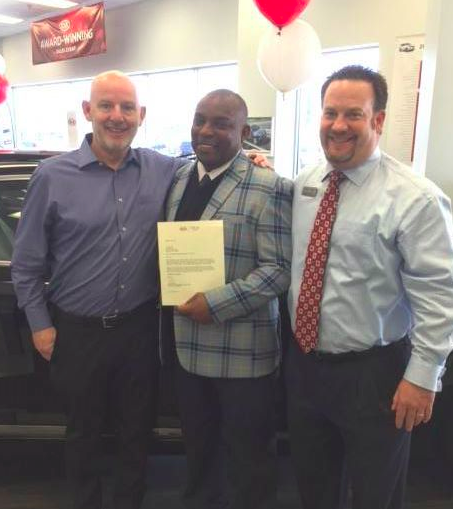 JT has won The Kia Elite Sales Award again this year which makes 6 years in a row for Elite Status!